November 11th is Veterans Day and it is right around the corner. I had a chance to create 3 more Veterans Day certificates to go along with the Navy Veterans Day certificate that has already been available. Find these beautiful certificates below along with some Flag Facts. You can use these printable Veterans Day certificates to recognize all of your special veterans. I have sent an extra newsletter out just so I could make these Veterans Day certificates available for each and everyone of you to download, print and personalize. 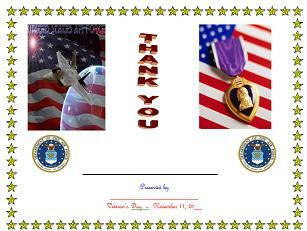 Click here to get to my Veterans Day page for these four beautiful Veterans Day Certificates. 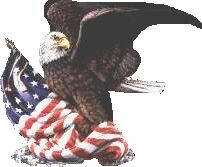 Congress first approved the flag on June 14, 1777. This day is now observed as Flag Day in America. It was first stated, there would a star and stripe for each state making 13 of both. Over the years, The number of stars has been changed to include 1 star for each of the 50 states, while the striped remained the same to represent the 13 original colonies. Later, the colors of the flag were given a special meaning. The red is for valor and zeal, white is for hope, purity, and cleanliness of life, and blue being the color of heaven, loyalty, sincerity, justice and truth. The name "Old Glory" was given to our national flag on August 10, 1831. The flag means "The Spirit of Liberty and Human Freedom".